Federal inspectors say they found dozens of rodents and poor worker hygiene at a North Carolina chicken farm operated by an Indiana egg producer that last week recalled more than 200 million eggs. INDIANAPOLIS – Federal inspectors say they found dozens of rodents and poor worker hygiene at a North Carolina chicken farm operated by an Indiana egg producer that last week recalled more than 200 million eggs. Inspectors found "unacceptable rodent activity" and dirty equipment at the Rose Acre Farms egg operation in Pantego, N.C., during visits from March 26 to April 11, according to a U.S. Food and Drug Administration report. They also noted employees touching dirty floors, equipment and their bodies without washing their hands. The unsafe conditions allow "for the harborage, proliferation and spread of filth and pathogens," inspectors said. Dozens of live and dead rodents, including baby mice, in chicken houses and manure pits. Condensation dripping onto crack detectors, egg graders and other production equipment.Water pooling on floors and forklift pathways. Grimy, dirty floors, pallets and equipment. Farm workers touching dirty equipment and trash cans as well as their face, hair and "intergluteal cleft," meaning their butts, before touching eggs or handling equipment that touches eggs without washing hands or changing gloves. In an emailed statement, Seymour-based Rose Acre Farms said the inspection report "is based on raw observations and in some cases lack proper context." "It’s unfair to be judged on the farm’s operation without proper perspective or a chance to formally respond to an incomplete representation of a massive facility that houses more than three million hens," the company said. The company said it will make public its response to the inspection, which is due April 26. "Until then, we would urge everyone to wait until all the facts are presented before rushing to judgment," the company said. The company, one of the nation's largest egg producers with 17 facilities in eight states, announced Friday it was voluntarily recalling more than 200 million eggs because of possible salmonella contamination. 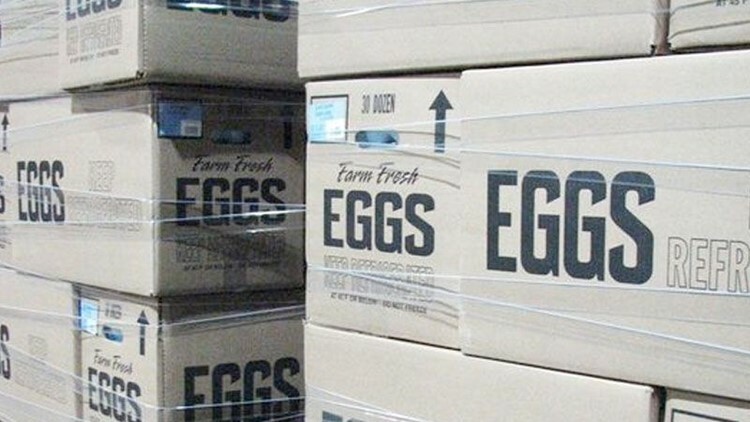 It was the country's largest egg recall since 2010. The FDA said at least 23 illnesses have been reported. The eggs were distributed to consumers in Colorado, Florida, New Jersey, New York, North Carolina, Pennsylvania, South Carolina, Virginia and West Virginia. FDA spokesman Peter Cassell declined to comment specifically about the Rose Acre Farms inspections but said the facility must correct the issues before the next inspection or face repercussions. Consequences could include product seizures or, in a more serious step, shutting down the facility. Cassell encouraged shoppers not to assume that they are not exposed to the recall because they are not geographically near the states where cases have been reported. The recall involved eggs sold under the brand names Country Daybreak, Crystal Farms, Coburn Farms, Sunshine Farms, Glenview and Great Value. Also included were eggs sold at Walmart and Food Lion stores. The cartons were stamped with plant number P-1065 and the Julian date range of 011 through 102. The company's Hyde County Egg facility in North Carolina produces 2.3 million eggs a day.